Strings On Brass, under the direction of Vic Bird, is a great looking, great sounding and very entertaining musical group consisting of 28 musicians. 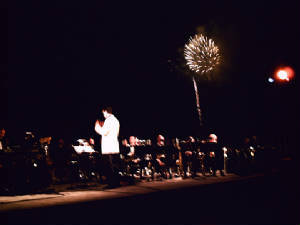 It's not just a Big Band and it's not just an Orchestra. It's a Big Band with a String Section and it's unique. 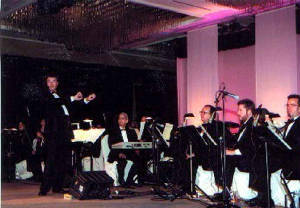 We have performed from San Diego to Orlando, Pittsburgh to Las Vegas and from Atlanta to Dallas, Houston and San Antonio. 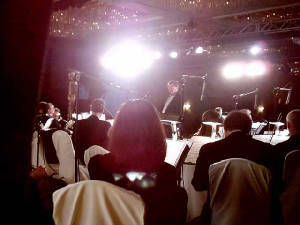 We've played in ballrooms, outside under tents and on the deck of an aircraft carrier. Vocalists, both male and female, are also an option. 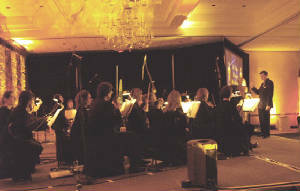 The orchestra has been used for star backup, award banquets, weddings, dinner dances, ambiance and concerts. For smaller budgets it is possible to use a smaller version of Strings On Brass and still get the unique sound. The music samples you are listening to were recorded live at various locations where Strings On Brass has performed. If you, your company or organization has a need for a classy, great looking, great sounding and versatile orchestra, we'd like you to consider Strings On Brass. For more information, call 407 234-4640 or email vic@victorbird.com.